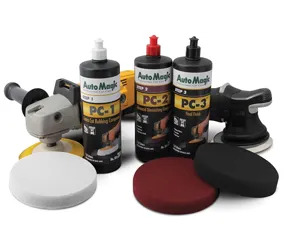 Auto Magic’s PC 1-2-3 Paint Correction System is the company’s most flexible and reliable innovation to date. It can address most paint issues from swirl marks to paint oxidation and leaves a brilliant finish. The paint correction system is part of Auto Magic’s 6 Stages of Reconditioning, a comprehensive step-by-step system that addresses the detailing process that help shops save time and money. The product is silicone free and body shop safe.